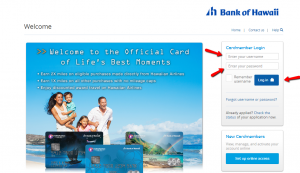 The Hawaiian Airlines Bank of Hawaii World Elite Mastercard provides you not only an amazing miles rewards system and numerous yearly and signup bonuses but also an easy-to-use online platform where you can manage your account. 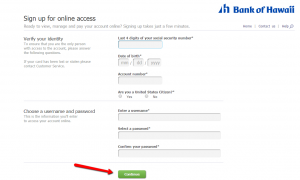 Here, we will show you how to sign in, retrieve your credentials and enroll in online banking. Step 1: Go to the credit card’s homepage, scroll down, and click on the ‘sign on’ button in order to open the log in page. Step 2: Introduce in the appropriate fields your username and your password and press ‘Log in.’ Now you will be able to manage your account and make payments online. Step 1: Open the credit card’s log in webpage and click on ‘Forgot username or password?’ in order to open the credentials retrieval page. Step 2: Enter the last 4 digits of your social security number, your date of birth and your account number and click on the ‘Continue’ button. Step 1: Open the credit card’s log in page and click on the ‘Set up online access’ button in order to open the registration page. Q: What can happen if I accidentally enter the wrong financial information while filling in the application form? If you enter the wrong personal information, you do not need to worry, since that does not affect your account eligibility so much as the entering of wrong financial information, such as employer information or annual income. For this information to be entered right is extremely important since there might be consequences, like immediate rejection of your application. So, it is advisable to fill in the application accurately, since it shows your responsibility and seriousness. Q: How to decide whether to enroll for electronic or paper statement? There is not a huge difference between these two. Whether you will chose one or another depends on how often you use online banking, so as to see the statement on time. Both of them must be identical. You are the one that can determine which one suit you better even though credit card issuers are constantly trying to convince their customers to switch from paper to electronic statements. Q: What benefits do I get if I open an account at the Bank of Hawaii? Once you open an account at the Bank of Hawaii, you become a new cardmembers who is eligible to earn a one-time 50% off discount. This discount can be applied to roundtrip coach fare for a Companion and is valid for 13 months from account open date. Also, the Primary Cardmember is also eligible to earn a one hundred dollar discount off one coach companion ticket on each credit card account anniversary. Discount is not applied to taxes, fees, and surcharges.